We received another package from Zonderkidz, and this time it was something for my boy! 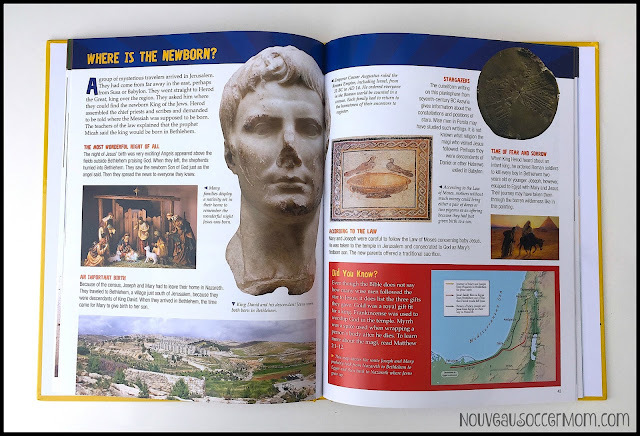 Ben loves books with facts and information and we selected The Bible Explorer's Guide: 1000 Amazing Facts and Photos for him. From the online description, I hoped it would be similar to another non-fiction series he enjoys, with lots of photos, maps, descriptions, and facts, all mixed in per page. I was very happy to discover that the book is written in the same great format I was expecting. The Bible Explorer's Guide is arranged chronologically. It begins with a short intro, "Let's Explore the Bible", that explains where the discoveries of Biblical texts happened, then starts with "What Happened in the Beginning?" and ends with "Writing the Rest of the Bible." There's also a timeline of events and a who's who of both the Old and New Testament to help organize the book. Each two page section features a different topic of the Bible, from people to places to events. What I really love is that the material is not simply written out. 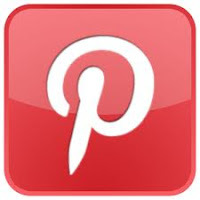 There are maps with locations noted, Biblical facts and references, historical facts that explain what was happening in the era or why something was done, contemporary facts and artworks of the places or events referred to. There were plenty of moments where Ben showed me something that I had never heard before and even more connections made of "So this is why they did/said that!" 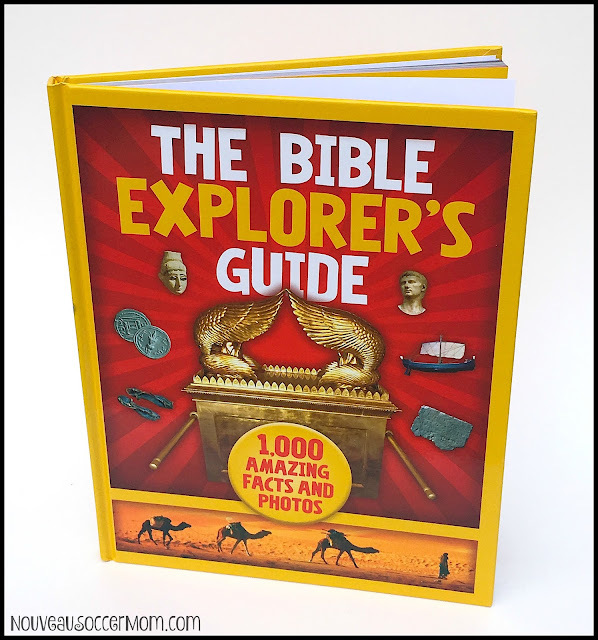 The Bible Explorer’s Guide lets children come up close and personal with everyday life during Bible times through photos, maps, and illustrations illuminating, people, places, objects, and buildings of the Bible. What did Noah’s Ark really look like? Who was David and whom did he fight? How did 1st century citizens of Jerusalem live? Each two-page spread is filled with images that bring history alive and drawings that help bring life to people and places that we can only read about. With fascinating, brief text and full-color captivating images, this is a reference that kids will come back to again and again. While I did select the book for Ben, all three of us really have enjoyed looking through The Bible Explorer's Guide. The layout makes for an interesting read and an easy book to just pick up and find out new information. We would definitely recommend it for your library! Disclosure: A copy of The Bible Explorer's Guide: 1000 Amazing Facts & Photos was provided to me for the purposes of this review by Zonderkidz.